5 May 2010, at 8:53a.m. ITALY - Aviagen Italia recently held a half-day seminar on ventilation in Bologna with world-renowned ventilation expert, Dr Mike Czarik. The event was attended by nearly 100 attendees, representing all major Italian poultry companies and several of the country's broiler growers. The reason for the seminar was to improve the understanding of the importance of good ventilation. The seminar focused mainly on the principles behind 'Minimum Ventilation Requirements', the reasons for the targets stipulated and ways to achieve them. The seminar began with an overview of the Aviagen structure in Europe by Claudio Ambrogio, General Manager, Aviagen Italia. This was followed by a presentation on the critical aspects of a successful chick start given by Lorenzo Rossi, Aviagen's Technical Service Manager for Italy. Dr Czarik then gave the first of his talks on the subject of litter management. After a break for lunch, Dr Czarik introduced his second presentation on winter ventilation, which was followed by a valuable question and answer session for the attendees. 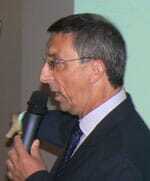 Claudio Ambrogio said: "It has been a great honour to welcome Dr Czarik to Bologna for this seminar. It is a great thing for our customers that we are able to bring over experts like Dr Czarik to speak at our events. He has been one of the biggest innovators in ventilation for many years and his specialist knowledge of ventilation techniques makes him a superb speaker. At Aviagen, we are delighted to maintain our relationship with him. "Attendees responded enthusiastically to the presentations and the chance to put questions to Dr Czarik was particularly appreciated as it is not everyday that the opportunity arises to meet with such a highly regarded poultry expert." Mr Zavattini, breeder manager of AIA, said: "This seminar was important to me as it stimulated a new vision of the importance of ventilation and it will reinforce our strategy of improving the standard of equipment we use."